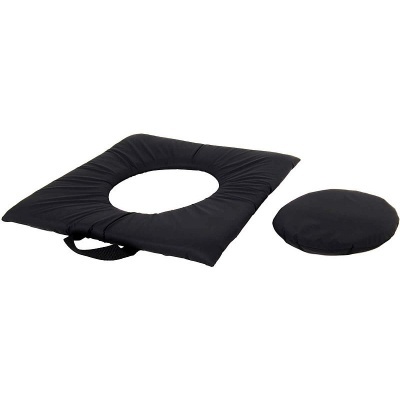 For patients with low levels of mobility, the use of a pressure relief cushion may be necessary in order to prevent the development of pressure ulcers. The Systam Gel Commode Pressure Relief Cushion is designed for patients at a medium risk of developing pressure sores, featuring a removable central pad for use on commode chairs. With a core made from viscoelastic gel, this cushion provides excellent comfort and an impressive capacity for pressure distribution. Since this cushion includes a removable central pad, it is suitable for use with normal seats as well as with commode chairs. This makes it a perfect option for incontinent users, as it can be transformed from a full pressure relief cushion into a commode seat in seconds. This high level of versatility means that this cushion eliminates the need for multiple separate cushions, as it will prove useful through a range of situations. Since the Systam Gel Commode Pressure Relief Cushion is designed for use with incontinent users, a waterproof outer layer is crucial. This cushion is made with a 100% impermeable membrane, meaning that spills and fluids will flow off without any long-term damage or need for deep cleaning. It is also supplied with a two-way stretch waterproof cover, making it more hygienic and extremely durable.